Two tiers of facets on the crown are frosted to create a Star of David. Finished in blue sapphire to match the Israeli flag. At high magnification a slight asymmetry in the shape of the table is apparent though I cannot discern this with the naked eye. 'Gram Emerald', Design by Jeff Graham, 45 facets. 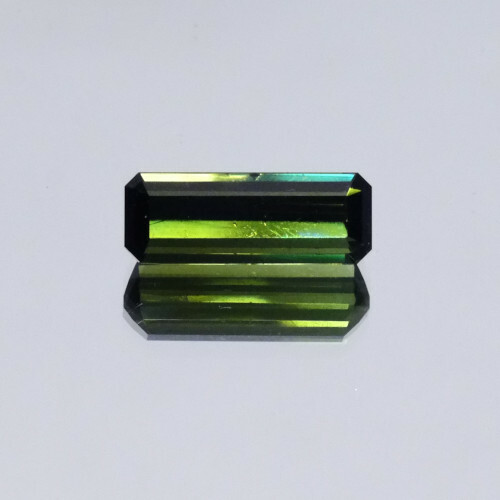 Cut in dark moss green natural tourmaline. This is not the highest quality tourmaline hence the low price. However the cut is certainly to at least my usual standard. The stone is eye clean and large enough to form the centrepiece of a pendant. Two tiers of facets on the crown are frosted to create a Star of David effect. Cut in white sapphire - a very bright sparkly stone. The final high polish is achieved with 0.25 micron diamond polish on a ceramic lap for extra flatness and crisper facet edges. This followed a deep pre-polish at 3 micron on a Batt lap taking over 11 hours to cut - aligning the facets is a bugger!. This is a bit different - and difficult to photograph (see video for a better impression). The stone has a brilliant cut pavilion for sparkle. The crown has a triangular table with three hemi-circles around it. The rest of the crown is left very lightly frosted. Two tiers of facets are left frosted to create a pentagram flower design with polished ‘petals’. 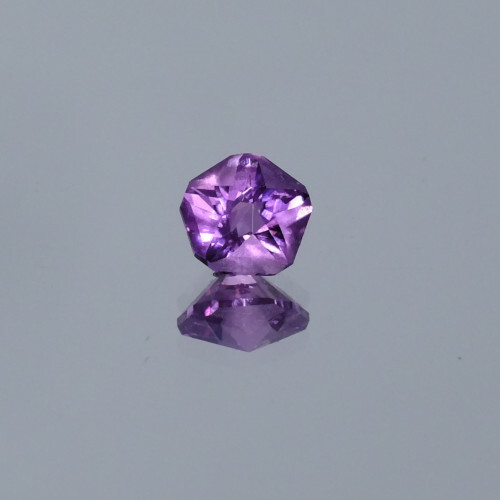 Cut in bright lilac sapphire - a 'hot pink' stone. The final high polish is achieved with 0.25 micron diamond polish on a ceramic lap for extra flatness and crisper facet edges. This followed a deep pre-polish at 3 micron on a Batt lap taking over 9 hours to cut. I feel there is too much emphasis placed on clarity and lack of inclusions. Rutilated quartz is a lovely material with fine needle-like stands of golden rutile (titanium dioxide) making for a very interesting stone. 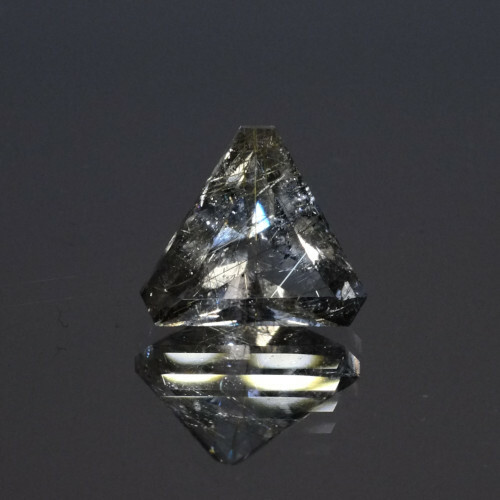 Faceted rutile quartzes are regular award winners in major faceting competitions. The rutile strands can however make polishing the surface a bugger. This was triksy to photograph - see the video for a better impression. The final high polish is achieved with 0.3 micron chromium dioxide polish on a darkside lap for extra flatness and crisper facet edges. Hanami (花見, "flower viewing") is the Japanese traditional custom of enjoying the transient beauty of flowers 'Hanami', modelled on a cherry blossom is becoming one of my favourite cuts. A set of tiers is left frosted with the 'petals' polished. A delicate subtle cut! - apologies for the poor photo - the video gives a better view. AS for the colour. Well I thought I was ordered a kunzite colour - a light lilac. It looked lilac - however on cutting I found it to be more a shocking electric pink. I like this and will definitely get more if it is available. The final high polish is achieved with 0.25 micron diamond polish on a ceramic lap for extra flatness and crisper facet edges. This followed a deep pre-polish at 3 micron on a Batt lap. This stone took me about 9 hours to cut. Classic square baguette design, this is a rather classic look, very bright showing off the colour well. The cutting was freehand i.e. not from a standard design. An artisan jeweller should have no problem making a setting at a reasonable price creating a remarkable unique piece at a fraction of the cost of the high-street. The final high polish is achieved with 0.3 micron Cerium Oxide polish on a ‘Darkside lap’ for extra flatness and crisper facet edges, this following a deep pre-polish at 3 micron on a Batt lap. This stone took me about 10 hours to cut. An interesting variant on the ‘square barion’ concept with the table rotated by 45 degrees. This has been used in cutting competitions in the UK and US. The pavilion is essentially brilliant cut giving a very bright sparkly appearance with plenty of dispersion. The stone is a deeper blue than appears in the photograph. This stone are much better polished than you are likely to find on the high street giving a much brighter stone. As a technical note this unusually high polish is achieved with 0.3 micron Aluminium Oxide polish on a ‘Darkside lap’ for extra flatness and crisper facet edges. This stone took me about 11 hours to cut. 9.1 mm diameter face to face. An interesting varient on the ‘opposed bars’ concept. Usually opposed bars design have the bars inverted (orthogonal) with respect this design. 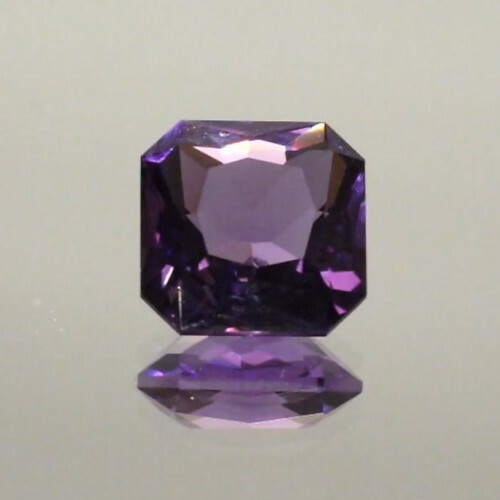 In deep blue sapphire the design is dark but as the stone is moved squares flashes occur. A large stone suitable as the centre of a pendant or dress ring. Arya produced a series of designs in the 'Tessellation' series of which this, a competition entry is my favourite. A rather ‘technical’ take on a traditional shape. When I first saw this I thought - "hmm OK, standard looking triangle". Upon cutting I thought "Wow". This is one of the brightest designs I have ever seen. Arya is an accomplished designer and the myriad internal reflections make this one of my new favourite cuts. The devil you say! Lucifer is also known as the light bearer. I don't think I could have come up with a better name for this fiery gem. This is a super nice triangle. It is bright, has lots of action. Also very unusual with it's asymmetric crown - the twisted triangle concept. Lithium Tantalate is a labgrown ceramic occasionally used in specialised semiconductor sensors. Very rare this piece is a legacy of the soviet defence industry. 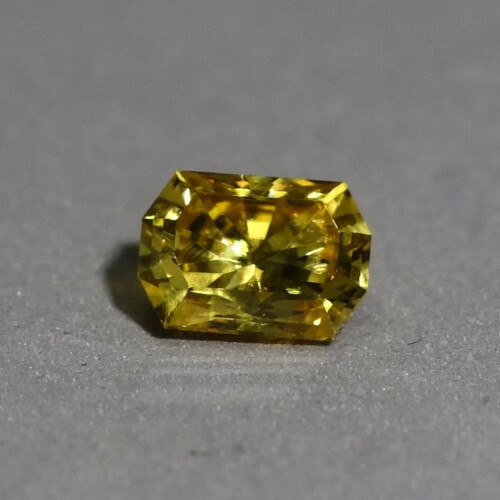 With a high refractive index (2.2) similar to that of diamond and crazy high dispersion - three times diamond's this is a very attractive material. With such high dispersion one sees rainbows in direct light. Super - If you can get any! The stone is cut with a brilliant pavilion (bottom) and a step cut crown. Sweetheart is a classic heart shaped cut by the noted designer - the late Jeff Graham. 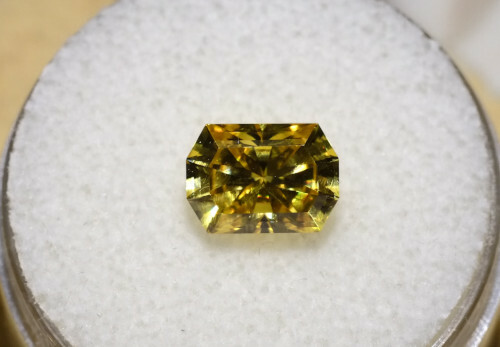 This would look nice as a single stone in a pendant or large ring. The stone is cut with a brilliant pavilion (bottom). 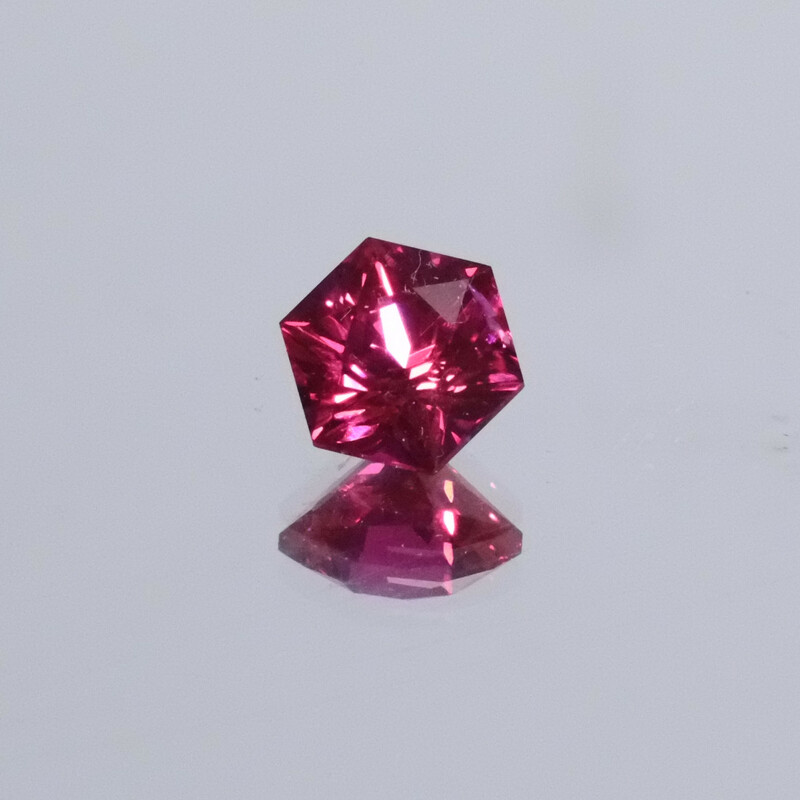 Ruby is a dark stone, however this size and cut gives blood red flashes in direct light. Gemstone photography is awkward - the stone is a deeper blood red than the images show - rather gothic really. Sweetheart is a classic heart shaped cut by the noted designer - the late Jeff Graham. Another slightly unorthodox cut. The design is by Marco Voltolini - unusual in being hexagonal - though this does make it easier to set. The lowest tier of facets on the crown (top) are frosted to enhance the petal effect. An unusual and rather difficult cut. Reminds me of an Escher drawing, when moved the central cube appears and disappears. This particular cut is surprisingly tricky, I went through a number of stones before I got it right. It took so long that I am unlikely to do another for some time. Design by Dan Clayton for the U.S. Facet Cutters Guild competition in 2010. This is one of my favourite cuts and straightforward to set as a pendant or ring. 'Alien Outpost' by Greg Glenn. I do like trillion cuts. The cut is 'Alien Outpost' by Greg Glenn - a classic gemstone designer. 49 facets optimized for sapphire. This stone was very slowly cut to minimise sub-surface damage, mostly on 3000 grit, pre-polished on 8000 grit and finished on 100,000 grit using a ceramic lap for maximum sparkle and flatness. A very bright and relatively large stone I feel this would make a stunning pendant even in a minimalist setting. Looks stunning in this very simple silver bar setting which really shows the stone off. So little metal touches the stone that it really flashes in sunlight.